In this day and age, it’s common to have many relatives and friends far from home. Which is why traveling has become a crucial part of everyone’s lives. 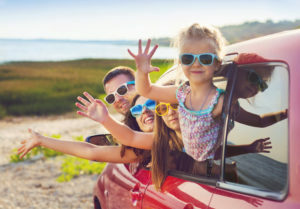 In the summer months, it is also a popular time to squeeze in a fun family vacation. But regardless of if you are taking a two-hour drive or a four-hour plane ride, you will likely end up feeling tired, cramped and sore. Having to sit in one position for an extended period of time can numb your muscles and quickly make you feel uncomfortable. This is because the blood flow tends to get restricted and is not able to travel freely through your body. You should always prepare your body for travel. How can you do that? Easy, warm up. Perform a couple of stretching exercises. Take a walk and move your muscles. Do an exercise that focuses on the circulation of blood flow to each and every part or muscle of your body. When traveling by air, make sure that your seat is not hollowed. Hollowed in seats can cause you to sit in an uncomfortable position, leaving you irritated. If your seat is hollowed, put cushions on the seat or any kind of small mattress. Moreover, your spine is shaped in a curvy way. To maintain that curve while sitting, put a pillow behind so as to support your back. Tuck cushions just on the space of your neck and headrest so as not to cramp your neck muscles. Check the weight of your baggage before you leave. Because if the baggage weighs more than your body weight, lifting them up to put them inside compartments can cause pain in the lower back. Moreover, whenever you put the baggage inside the compartment, make sure you are not rotated in a different position or angle. Twists and turns to tuck the luggage in while being in a rotated position can cause pain in the neck. And when stowing your luggage under the seats, make sure you don’t twist or turn in an awkward position when doing so. This can cause unwanted muscle strain. Always try to sit in different positions to keep the blood flow steady. Lean your legs against bags or bring your knees up and down. When traveling by car, always make sure to adjust the seat if you’re the driver. Bring the seat close to the steering wheel, as is comfortable to you. Make sure your knees are in a higher position than your hips. To check that, just slide your fingers behind the back of your knee near the thigh. If you fail to slide the fingers, adjust your seat. Use a cushion to keep your back straight. Make sure not to grip the steering wheel too hard. This can constrict blood flow. Exercise your eyes by moving them in different positions so as not cause stress or headaches. Always take breaks when driving as well. These are simple steps on how you can travel comfortably. If you experiencing post travel pains be sure to make an appointment with Hill Chiropractic. Travel safe this summer!